DetroitKnitter: Glittens - A video KAL! Glittens - A video KAL! I'm going to need a new pair of gloves for my job and these will be just perfect. Oh yeah, did I mention that my independent evaluation showed up Next Day Air today stating I'm fit to return to my regular job. Funny... I don't really feel all that fit. I hope it goes well! SOOOOOOO, without further delay I've decided to knit the "Glittens" that Melinda (aka WildMountainHoney) was nice enough to post pictures of her fabulous and quite colorful glittens. You can view her Glitten posting here. The pattern that Melinda used and that I'll be using can be found on this blog over on the side bar. 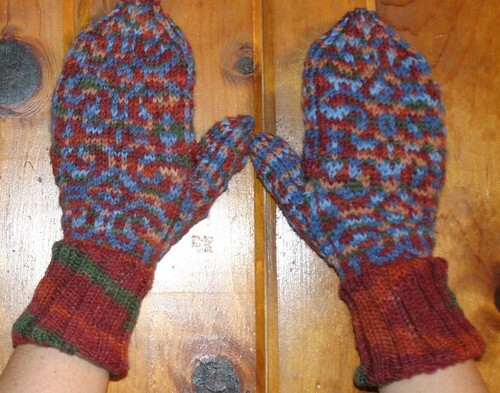 To be more specific the Glitten pattern is here and a pictoral page here. Here are the first 4 videos of my "Glitten KAL Playlist " to kick off this video KAL. Before we can knit 2 colors we need to know how to add the other color! Weaving or wrapping as demonstrated here is how I'll add my second color. The Two-handed Fair Isle Technique - This is a great video for 2 color knitting in the round but if that seems a little daunting you can always use Amy's Stranding video above. Ok that's enough information for one post and a bit a head of my knitting! I put together a video of this project basically step by step. Here's the Glitten YouTube playlist.